Goodbye Bush, Hello President Obama! Washington should cease unilateral strikes into Pakistan’s tribal areas. Its aggressive approach has inflamed public opinion, undercut Islamabad’s own counterinsurgency efforts, and risked destabilizing an already fragile country. Instead, Washington should help strengthen Pakistan’s capacity to contain militants. The Obama administration should also break decisively with the Bush legacy of treating Pakistan as hired help rather than as a valued ally. Pakistan has paid a heavy price – both human and in terms of its socioeconomic stability – for being a frontline ally of the U.S. Thousands of people, including 3,000 law enforcement personnel, have been killed in terrorist violence since 2001. The economic cost is estimated to be around $34 billion. Ultimately, the atmosphere in Washington, D.C. and the rest of the world has been one of relief, to the say the least. Regardless if change is really in the cards, people seemed more than eager for an end to the Bush era. Above are two pictures I took in Washington, D.C. two days ago, where an enormous inflatable George Bush doll was set up for people to throw shoes at. Yes, shoes – a la the Iraq-shoe-throwing incident not too long ago [see related CHUP post]. Every time a person managed to get a pair of shoes around “Bushoccio‘s” nose [as the badge on the doll’s chest read], the crowd cheered. Just a small example of the fervor that persisted in Washington this inauguration week. Remember, remember, the fifth of November. As I sit here watching the victory celebrations for the election of Barack Obama, I cannot quell my envy for the democratic institution in place in the United States. As the chants of “Yes we can,” and the drum-roll of “change” resonate throughout the world, I cannot help but ponder the future of Pakistan and its leaders. Still marred by the politics of yesterday, Pakistan presents a major challenge to the next administration of the United States. With a failing economy, depleted foreign reserves, lack of investor confidence, and a pathetic credit rating, Pakistan and its allies face the major task of averting a crisis that could impact the entire world. Put plainly, the lack of economic independence for the people of Pakistan creates further instability for the political system, which inevitably would poses a security threat to the world at large. With Joe Biden by his side, Obama is sure to gain the wisdom of how to effectively deal with Pakistan. Biden was instrumental in the removal of Pervez Musharraf and the restoration of the Constitution following the declaration of emergency rule. Obama and Biden have both pledged non-military aid to Pakistan, but they must go beyond those promises. They must commit to building relations with the people of Pakistan, not through its government, but via its civil society, students, and lawyers. Outreach through such avenues would be instrumental in empowering the institutions that effectively aid and influence the people of Pakistan. As a Pakistani, I am most envious of the judiciary’s independence in the United States. For many Pakistanis wishing to see sustainable progress, economic growth and accountability in the country, the judiciary movement has not lost momentum. Obama and Biden must capitalize their support in this effort to ensure the Pakistani people’s support. As a law student, I have not been a staunch supporter of any particular judge, but I am in support of the rule of law and the independence of the judiciary. My reasons for being a supporter of the institution over an individual is based on a belief that Pakistan’s current political makeup of 45+ year olds come from the same school of thought – power hunger, corruption, and status building. Perhaps my opinion is naïve and unfounded, but history and the current “genius” leaders seem to be further testament to my assertions. Therefore, I caution the incoming U.S. administration to not further the individualistic aspirations of the current political makeup at the expense of institution building. For this reason, and this reason alone, many members of Pakistan’s youth, including myself, have left the politics of today and are focusing on the politics of tomorrow. President-elect Obama and his partner should take heed of this view, because the youth of Pakistan, which form the majority of the country, sees a tomorrow filled with greatness, transparency, and accountability. If they truly embody the vision of “change,” Obama and Biden should avoid the short-cut policies of yesterday, and focus on the long-term and sustainable institution-building tactics of today. Strengthening the institutions of Pakistan at the grassroots level would in turn impact global security. The people of Pakistan pray that President Obama and VP Biden will provide the necessary relief and policies that adhere to the “change” their campaign invoked, because “Yes We Can” resonates with all of us, Pakistanis and Americans alike. For a related source, read Frontline/World’s special, “Pakistani-Americans Stand Up,” part of their Elections 2008: The World Is Watching series. It’s official – with 338 electoral votes [270 needed to win] versus Senator John McCain‘s 159, Senator Barack Obama is the next President of the United States!!! On the eve of this historic election and in the midst of one of the greatest economic crises to hit the United States, it would seem that one thing is certain: Barack Obama will win this Presidential election quite handily. Looking into my crystal ball, I strongly believe it is likely that the Democrats will seize a filibuster-proof majority in the Senate and seize 30 more seats adding to their majority in the House. Do you know what happened the last time us Democrats held those kinds of leads? It was 1992 and a man named Bill Clinton won the presidency after 12 straight years of Republican rule. We were at the end [although we did not know it at the time] of 20 years of economic recessions and it seemed like Bill would fulfill all our wishes and those stodgy Republicans were through bossing us around and making us look like cruel aggressors and unilateralists in the international community. Do you remember what actually happened? The Democrats, us liberal intellectuals, well, we failed big time. We failed on every single count. We passed NAFTA, which has certainly been a double-edged sword as it has led to an expansion of the drug trade and illegal immigration in concert with an expansion in trade. Moreover, Bill and Hillary failed to get universal healthcare passed and not one significant new policy was enacted that most of us could recall today. Do you remember Bill’s theme song during that first election campaign? If you guessed it was ‘Don’t Stop Thinking About Tomorrow,’ then you would be correct. Let us think about the lyrics for a moment. “Everything will be better than BEFORE, yesterday’s gone…yesterday’s gone!” Right? Right…and what CHANGE actually occurred? Well, we got a president who could speak like his voice was coated with molasses and rainbows, was very popular with the American voter and was loved around the world by foreign leaders and foreign audiences. Does no one remember this? What did Bill actually accomplish? The answer…NOTHING. I love Bill Clinton the politician and the intellectual. I admire his guile, his wit and his charm. However, I still admit he accomplished NOTHING. The economy boomed as a result of the technological revolution and the outsourcing of labor to the developing world, thereby mitigating overhead costs due to low-wage foreign labor and increasing U.S. corporate profits. As with most major economic shifts, this was not because of anything a sitting president did. What did our early 90’s agent of change bring to us? Although he had affairs in the White House, we all still loved him [his approval rating actually went UP during this time!]. He encouraged us to think about what the definition of ‘is‘ is. Does this not remind you of anything? Should anyone forget some of his other gaffes in office, I would like to remind you: his ‘wag the dog’ air strikes against Libya to draw attention away from the Lewinsky affair, his botched humanitarian effort in Somalia, his complete lack of action during the Rwandan genocide, as well as a run of corruption charges to boot [notably Whitewater]. However, in November 1991, Bill was the young, hot, passionate oratory genius who would CHANGE everything with his Democratic majority. I will never forget that election or the passion that his campaign evoked in me because it was when I first fell in love with politics. However, I will also never forget my chagrin when I learned how easy it is to make phenomenal campaign promises and stir up public sentiment by promising CHANGE in Washington. We all believed in Bill, heck, most of us Democrats still love Bill Clinton. It’s too bad that those happy times are a delusion and nothing more. However, it serves as a poignant reminder and ominous warning about how we can twist our minds and our hearts to believe anything if it is delivered to us in a big red bow with our favorite song playing in the background. I know that many Democrats laud Kennedy the same way that Republicans delusionally prize Reagan as a great President. Before Kennedy’s untimely death, he had failed in Cuba [i.e., the Bay of Pigs], won a Pulitzer prize for a book he did not actually write [thanks Joe Kennedy!] and got us further entrenched in Vietnam. People still love him though, because he was handsome and young and could say things like, “Ask not what your country can do for you, but what you can do for your country.” Furthermore, his beautiful young wife and dashing brother completed the Camelot picture. Likewise, the Republicans claim that Reagan was the Great Communicator and the 2004 Republican National Convention was a Reagan lovefest. However, Reagan’s trickle-down economic policies paralyzed this nation, he was caught in the middle of Iran Contra, and anyone who gives one President credit for the fall of the Soviet Union needs to take a few classes on the Cold War. Furthermore, it is now clear that the man was suffering from Alzheimer’s while in office. Yet, still, because of the red bow delivery of the enigmatic Reagan, he is viewed by Republicans as a national hero. That brings us to this year’s election. The Democrats will win – oh yes, by a large margin – but I would really have to wait and see how this one plays out, because, as far as I am concerned, there has not been a great Democratic president since Truman. The pundits and commentators are cautious to say it because of President Bush‘s last two wins but all the numbers point towards a potential landslide victory for Obama. Also, record voters are hitting the booths which can only be good for Obama and the Democrats since the groups that rarely vote and support the Democratic party [college students and minority groups] will actually be at the polls this year. For all of you that view this election as an ‘US vs. THEM’ and you are a Democrat, then the question is not whether ‘we’ will win, but what will Barack Obama do with it? Quite frankly, I expect him to be popular, pass some legislation that annoys me, pass some legislation I agree with – nothing revolutionary, and nothing new. Politics on Capitol Hill and the White House will remain the same. If you would like to become a contributor for CHUP, email your article [no more than 700 words please] on a pertinent issue facing Pakistan to Kalsoom at changinguppakistan@gmail.com. On Tuesday, November 4, Americans will vote in a historic presidential election that has ignited not just the country, but the entire world. Although the U.S. media has obviously focused heavily on this election, it has also been widely covered by international news agencies. In fact, according to a BBC World Service poll released last month, which surveyed people in 22 countries around the world, Democratic nominee Senator Barack Obama was universally preferred over Republican nominee Senator John McCain. 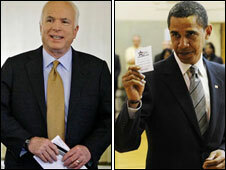 On average, 49 percent would like to see Obama prevail, while only 12 percent prefer McCain. Many of those polled said an Obama presidency would “fundamentally change” their perception of the United States. Regardless of whether or not that will truly occur if he is elected, such reasoning is still notable. Obama has not repeated his threat of attacks on Pakistan. But he has spoken of targeting Osama bin Laden, and taking him ‘dead or alive’. The bullish element in the Obama mix as such stays intact, but given that he has also mentioned closing down the notorious Guantanamo Bay jail, his policies may well offer more that is good than bad. 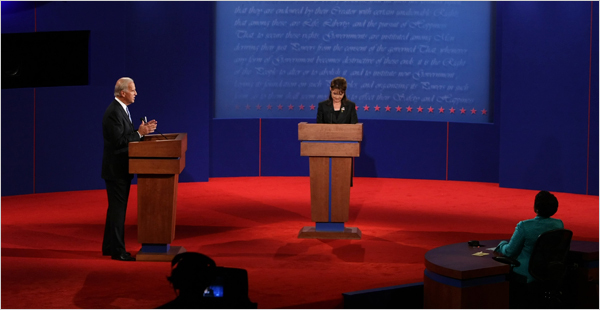 The first and only U.S. vice presidential debate between Sen. Joseph Biden and Gov. Sarah Palin just came to a close, and while I feel it was a clear win for Biden, Palin far exceeded my expectations. Viewers seem to agree – 84% of CNN viewers felt she did better than expected. Given the Governor’s recent “disastrous” interviews with Charlie Gibson and Katie Couric, many believed tonight’s debate would be a repeat of such performances. Nevertheless, CNN’s opinion poll still found that debate watchers felt Biden did a better job by a 51% – 36% margin. John continues to tell us that the central war in the front on terror is in Iraq. I promise you, if an attack comes in the homeland, it’s going to come as our security services have said, it is going to come from Al Qaeda planning in the hills of Afghanistan and Pakistan. That’s where they live. That’s where they are. That’s where it will come from. Both are extremely dangerous, of course. And as for who coined that central war on terror being in Iraq, it was Gen. Petraeus and Al Qaeda, both leaders there and it’s probably the only thing that they’re ever going to agree on, but that it was a central war on terror is in Iraq. You don’t have to believe me or John McCain on that. I would believe Petraeus and the leader of Al Qaeda. On that point, Biden was referring to a Washington Post article released today citing the U.S. commander in Afghanistan, who stated that while more U.S. troops are needed to fight the war there, “no Iraq-style surge” will end the conflict in the war-torn country. “The word I don’t use for Afghanistan is ‘surge,'” but a “sustained commitment to a counterinsurgency effort that would require a political solution, he told the Post. Moreover, despite Palin’s repeated referrals to that U.S. commander as McClellan, his actual name is, Gen. David D. McKiernan. Perhaps the Governor confused him with Maj. Gen. George McClellan, who led the Union Army during the U.S. Civil War?